I've currently no actual Nixdorf technical information relating to the 1528-0x DAP4 CPU, but what I've been able to figure out is here. The DAP4 was in service for quite some time, and was used as the main workhorse on several Nixdorf machine ranges including the 8850, 8860 and 8870 systems. I suspect that the only real difference between these CPU boards would be the boot loader and jumper settings, but I'm not sure. 1528-05 64K program RAM *Also note this variant does NOT have the 7905 -5v regulator on board. This means that it won't be able to use some of the older EPROMS. You can see the original mounting hole to the upper-right of the battery. I also can't be positive that all of the above boards are suitable for use with an 8870. The 1528-05 should be (as long as it has the correct character generator, boot ROM and jumper settings as that's the one I'm using. Talking of the jumpers, I've four boards and they are all set identically except for the most left hand link. I suspect it has something to do with which bank of program RAM (left or right column) is installed. When it's just the right column or both, then the link is missing. Just the left column installed then the link is present. It's just a guess unfortunately. There isn't really much that can be said about the keyboards. They either work, or they don't and I've never seen one that failed. They are connected to the DAP via a short SAS cable. On some keyboards there is a connector at both end but on the newer (white) keyboards they are terminated at the keyboard end with a Molex connector. All the keyboards I have are 0669-40 and are of the newer while type. Do take the base off any keyboards you get and remove any debris. You will find paper clips and all sorts of nasty rubbish in there. On the early boards this used to hold an 2516 (2K x 8 bits) EPROM. Later versions of the board replaced this with a pre-programmed mask ROM. It contains the bit patterns required to form each character for display. 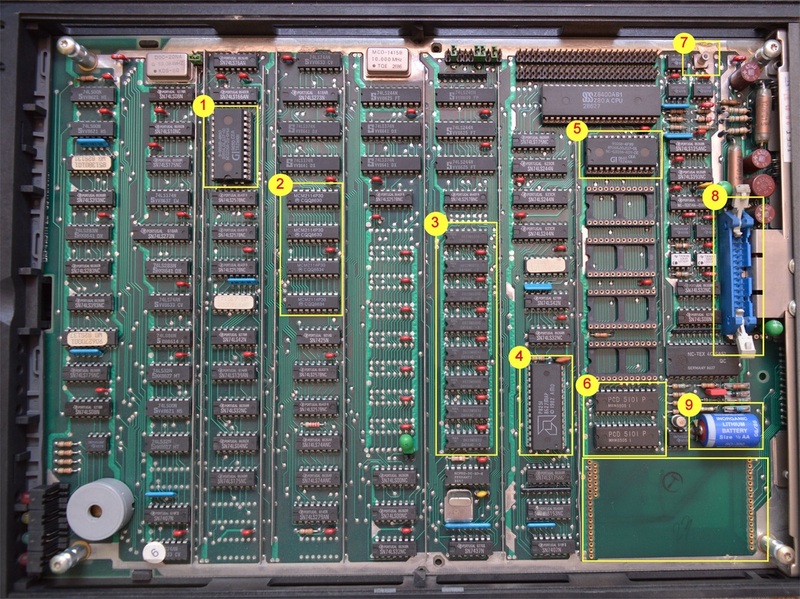 The 1528-03 board had an EPROM "33594 00 1 17 0001 ZG-DP66"
The 1528-05 board had a ROM "33594.01.117-00"
So it looks like the same ROM contents was used in these boards. However, watch out as EPROMS may not work correctly in the 1528-05 boards. This is where the CPU keeps the data for output on the VDU screen. The screen has a maximum resolution of 80 characters x 26 lines (lines 0 to 24 are usable by the host, the last line is a status line). Since a screen of 80 x 26 would require 2080 bytes, 32 bytes more than available, only half of the last line is actually usable by the VDU CPU. The memory in this section holds the workstation program that's eventually loaded from the host system. You can see there is room for 16 RAM chips (no parity on this RAM bank). I've seen total memory sizes ranging from 16K to 64K, though I'm not sure how much of that 64K is actually addressable. If you want to know more about this, check the data sheet below. This is where the boot loader ROMs reside though I've never seen more than one ROM installed in this bank. In later revisions this contained a mask programmed ROM that replaced the earlier and much more expensive EPROMS. The 1528-05 board had a ROM loader "85168.00.217-01"
So it looks like the loader program never really changed. This is where the keyboard/VDU parameters are stored so you don't have to keep entering them every time you switch the terminal on. The 5101 were used on the later release CPU boards, but the IC's appear to be basically identical. This socket accepts a fly lead that comes from a small PCB on the back of the tube and contains the composite video data for display. This battery is responsible for keeping power to the NVR when the terminal is switched off. Great in theory, and I suppose Nixdorf didn't think these terminals would be around for 30 years, but the retched things have a habit of leaking and destroying the board. Look at it's expiry date in the picture - 08/86. Amazing it's not leaked. The boards contain other components that are worth mentioning. Another PROM that can be found is the HM3-7621A-5; again, a Fuse-Programmable link PROM. I suspect that all the PROM variants are actually pin compatible. Usually the PROMs are soldered in-place, but I've got one board where some of them are in sockets. It's also a later variant which implies that either it was replaced as faulty, or a socket was fitted as somebody was considering the future need to upgrading them.